I should start by prefacing this with a disclaimer, I am not an expert and I’m not claiming to know it all. I taught myself then compared notes and information with other like-minded anglers who fish similar water in this area. I tend to fish streamers more often than not, partly because it fits my style of angling and partly because I love watching trout chase down and attack prey. Streamers allow me to cover more ground and move up or downstream faster than if I was fishing a nymph rig simply because it’s one fly and I don’t have to re-weight or adjust an indicator every time I move. Dry flies are fished any chance I believe they will be more effective than streamers, and nymphs (although terribly effective) are saved for those occasions when I don’t think a streamer or a dry will be the choice for the day. Admittedly I should fish nymphs more often than I do, ask Wendy Berrell. I fish an 8’6″ 3wt rod and I do alot of roll casting which can be a particular challenge when your flies are heavier. After recent days fishing streamers and discussing with other anglers I believe certain generalities can be applied. I should also note that despite my being somewhat proficient at this I should heed my thoughts below and check myself from time to time, occasionally my brain shuts down when I see perfect opportunities. Lastly, the best way to get better at anything is to just do it, evaluate, adjust and repeat, there will be a learning curve that is different for everyone. In this spot I made a roll cast to the star and let it sink for the duration of the filled line. Then I lightly stripped out from under the log and watched a 15inch brown come out. Cast at every inch of water when fish are hitting streamers, there are fish everywhere in every depth of water. Be ready to set the hook the second that your streamer touches the water, line management is crucial. 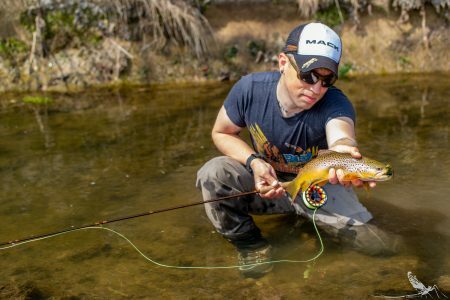 Bring your streamer all the way back to your feet, trout often follow streamers further than you would think and if you can’t see your fly then you can’t see what could be following it. Learn to roll cast heavier flies. This requires practice as you’ll need a fluid motion to prevent your heavier fly from sinking just prior to making your forward cast. Structure I almost passed up one day. I crouched on the same side of the bank, made a short roll cast to the star and let it sink to the apex and just raised my rod tip to bring it out, it was smashed by a brown holding under that tree and grass. Assess the trout activity to help determine the retrieve needed for the day and if you don’t know what the activity level is start with a dead-drift and increase the amount of motion/speed at which you strip according to the reaction you get from the fish. Do this until you have a handle on what is working for that particular day. 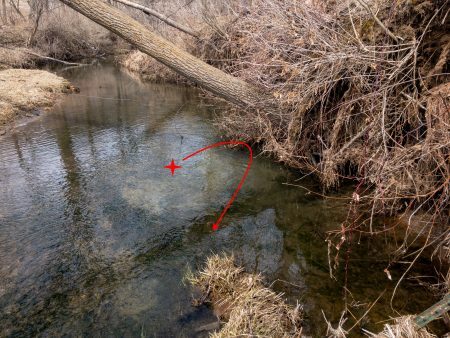 If the trout are actively feeding as observed by rising, trout holding in riffles or higher in the water column then a more aggressive strip is where I typically begin. Vary your approach. If a dead-drift or traditional upstream cast isn’t working, fish down and into a faster run making sure to keep the fly under the surface of the water. Target structure and remember that structure isn’t always obvious, it can be just grass that is hanging over the edge of the water. Use shorter leaders between 8-9ft topping out at 3x. I prefer 3x when fishing streamers and as of late I’ve been fishing a sinking leader which as I type this may become my new norm. Note: the comment here regarding 3x is sort of a minimum guide if you were cutting down a leader. Streamers are still very effective with thicker mono as well. Like all flies you have to get them to the trout. This can be difficult with streamers due to the feathers/fur/fluff added to increase the size and thus the drag in the water, adding weight or using a sinking leader will help with this. Casting up a head of the targeted pool, mending line to decrease drag and allowing your fly to truly dead drift will also help with this. Once the fly is as deep as you want it then either watch for strikes or begin to retrieve the fly. Hit the bottom (emphasis for the note above). Trout and especially large adult trout are benthic feeders who often eat on or very near the bottom of a pool or run. 3x tippet is a must here and a net isn’t a bad idea either. No Guts, No Glory. Risk loosing those streamers or sit on the sidelines. That means casting to snaggy areas and being ready (3x tippet!!) to fight whatever may come running out. Often you’ll have to force a fish quickly or risk losing it to snags, this is why I use 3x tippet and plan my exit strategy for a snaggy looking spot before I make my first cast. Know when to move on. Its possible to sit on a deep hole all day long and never quite figure it out and at some point you have to cut your losses and move on to fish the next spot. Fish streamers with more flash in dirty or stained water and fish the more natural colored flies with less flash in the clearer water. Know and accept when you should fish nymphs or dry flies instead of fishing streamers, this one is particularly relevant to me as I’ve been known to go all day fishing a streamer when nymphs would have been much more effective. If you’re specifically targeting big fish in snaggy places…bring a net. It’s sometimes a pain but it’s much better for you and the trout. Fish streamers in the rain, just do it. Every time it rains, go fishing and fish streamers. The rain brings out the big boys, they are more apt to eat and the rain breaks up the surface of the water and provides you more cover. The green line represents my cast to the star. I let this sink and watch for a flash then when the fly is at the apex of the curve I will strip it out or lift my rod tip to bring the fly slowly up. All of the above rules still apply more or less. Smaller water just poses more of a challenge because you don’t have as much room for error. Cast down and in…I do it ALL the time and often it is literally the only way to fish some spots. 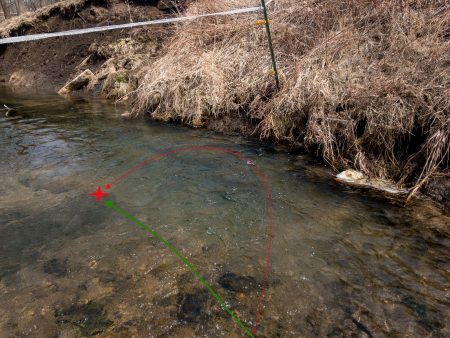 Look at the picture to the right, a down and in approach is the only option (note the fence and the wire you may not be able to see hanging only 18inches off the water) and if you target the area to the left of the faster water and allow your line to be taken by the fast flow it will swing out and into that faster current. Watch for a flash, if you see one set the hook. This approach forces trout to choose, if they want your fly they will come up for it and if not you’ll know in a few casts and you can move on. I typically spend 5-10 or less well placed casts in a spot like this one. Plan your first cast and make it count. I know this is me beating a dead horse but if you come up on a long slow pool and ahead you see a nice run you have to really ask yourself where is the best chance you’re going to get a fish to commit? If you cast a well placed fly into the slow area behind the run and spook trout they will move up into the run and even if they aren’t totally spooked they will put the fish in the run on edge and from my experience this is counter productive. The broken water is almost always the best place to start when fishing small water or when water levels are low. Bow casts…be careful with your rod but I do this a lot. Have a variety of size and weights with your streamers (one reason I tie my own). I like to have larger two inch flies that have almost no weight for fishing the smaller water. When trout want that fly they will come out after it and you should know within a half an hour of fishing streamers if it’s going to be a day where the trout are active and smashing streamers, on those days you don’t have to worry as much about getting your flies to the bottom. Fishing a lighter fly will make less impact and spook less fish. Fish the small water on days when the larger water is blown out. 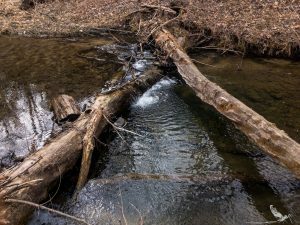 Often the smaller creeks will be only heavily stained which is perfect for streamer fishing on those creeks that run gin clear 90% of the time. I don’t make much mention of color with regard to flies in the above for a couple reasons. I tend to have materials black, olive, yellow and brown thus I tie streamers in those colors, it works for me. I know other colors work (Orange/Red/Yellow) and I’ve been experimenting with bright orange hackle and the barred yellow (seen above) in a few of my streamers. I met an older guy one day walking back to my car when I first started out and asked him what color fly he preferred, he responded “I’ll fish any color as long as it’s black.” I fished a black bugger type pattern almost exclusively for a long time but the more natural olive/brown/grey colors have there place of importance. I really like to fish black streamers in heavily stained water. I feel like I could go on about this but at the end of the day everyone develops their own style of fishing a streamer and I think a big part of it is just facing the fact that if you’re a nymph fisherman who’s used to catching a ton of trout from the same spot that this isn’t that game. If you can get past that and are ok with some less than productive days because you’ve chosen to chuck a hunk of meat then I think you’ll find this rather satisfying when those amazing days happen. To round this out I’d encourage any thoughts that are contrary or complimentary to what I have written here to be commented below. I’m still learning and if you’ve got more experience or something I’ve written here goes counter to what you’ve noticed I’d like to know so I can improve myself. Great stuff Justin! Great tactics regarding streamer fishing. Like you, I learned from trial and error. I fish streamers 50 percent of the time, and especially when there is a bit of a stain on the water. On those days when Trout seem reluctant, you need to trigger their territorial and predatory nature by putting something big and obnoxious in front of them they may not have seen before. If you piss them off, they’re more likely to eat your fly. As for color, darker stuff on stained water and lighter colors on clear water. It’s not particularly intuitive, but it almost always works. When casting streamers to difficult locations or around snags or other obstructions, I try to check my surrounds before I cast and ask myself what the plan is if I do get a hookup. Can I walk the Trout to spot to safely land him? Or is there a direction I need to move my rod at the strike to avoid the Trout from bolting into snags? As you mentioned, downstream approaches can sometimes work the best. I love playing out a bunch of line and floating flies down to pools or runs, and then aggressively stripping the fly back against the current. Sometimes this will trigger really big strikes. This can be particularly deadly with a floating bug, like a hopper. I guess it just looks like some type of fleeing water bug, but it just about always works. As you mentioned, I also like to try and let the current work in my favor. 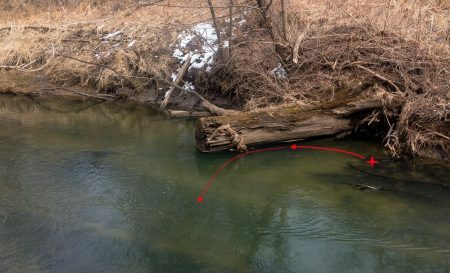 Find a spot where you can cast above the holding spot and let the current bring the fly into position. This works well on undercuts or deep runs along banks that can’t be approached from downstream. Thanks for the thoughts Bill. I totally agree with your assessment of the down and in and the strikes being explosive. Great post! I am stuck in the nymph rut and I know I should be switching it up more often. So many of great points to think about. How you approach water was very helpful. And how you cast – roll casting. Good I can do that much. I also like the idea of moving more and seeing more water. I’m sold on that idea. Nothing like seeing whats around the next corner. Thanks again. I plan on rereading this before I head out for that last little bit of inspiration to try the streamer. Glad it helps Dan. Let me know how things go for you the next few times your out. 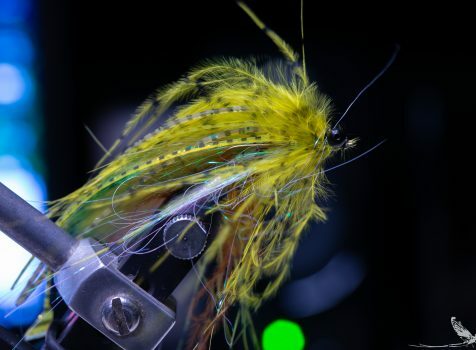 One of the great thing’s about streamer fishing and tying your own is that you can really get creative at the vise. I have a core group of streamers that I’ve fished with for years. In a lot of different color combinations and materials .But yet all relatively natural in color schemes. I easily get bored fishing the same thing over and over again season after season and there’s always new materials coming out each season to try and experiment with. For me part of the fun of streamer fishing is that total artistic creative side at the vise and then how the fly fishes. Like you I like to cover water and see what I can get a trout to hit on. To see if that late night creation at the vise over a craft beer or two does the trick. Or if it’s back to the drawing board for a little tweak here and there. All in all just great fun! I totally agree, one of the reasons I think I continue to love fly fishing is the connection to tying and creating something new and knowing it may be that new thing that trout love. This stuck with me. I think if someone is wondering what type of fishermen they are, this statement can be helpful and insightful. If you are a person who has to actively choose not to use a streamer, then you’re a streamer fisherman in mind. For me when I read this, I found myself thinking, “ but I get excited when I see fish rising and I can switch to a dry fly” or “ I like when I come along shallow runs that I can no line with a soft hackle.” So I think this statement really help me commit to the fact that I’m not a “Streamer fisherman.” Im a mixed bag, fish with my emotions and not head kinda guy. If I feel like throwing a hopper dropper tomorrow in the snow, stupidly, I might do it. Thanks for a great post and thanks for giving me not only tips but time for introspection. D. Your comment made me assess myself and I guess… I am a “streamer fisherman.” I have goals this season to work on curbing my addiction to them and forcing myself to toss caddis, dry/droppers, nymphs, hoppers! I used to be much more versatile and it’s a place I want to get back to a bit more. Perhaps we need to go out (when the snow fades…) and I can get some perspective from your approach. Great tips. Really useful for fishing my smaller North Eastern waters as well. Thanks! You’re welcome Will. Thanks for reading. awesome streamer days I get, like you said stuck in it. Then for the next week I am chucking every streamer you can think of with no repeat days and my buddy is lobbing a nymph rig and sticking them left and right. Hot streamer days are like crack, it can sometimes be difficult to stop but you have to rise above it.